I recently reread a wonderful account of the invention of thermonuclear weapons and the initial years of the cold-war, Dark Sun: The Making of the Hydrogen Bomb, by Richard Rhodes. The book goes into the science and history of the work done at Los Alamos, but also describes the political intrigues and espionage carried out on behalf of the Soviet Union. One thing that stands out is the number of Jews among the ranks of the atomic spies. The most damaging information was provided by the German physicist Klaus Fuchs who was part of the English team at Los Alamos. 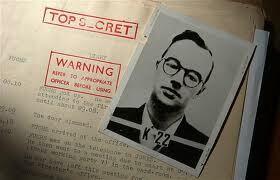 (Note: Klaus Fuchs was not Jewish, though there are false indications around the Internet that he was.) His reports detailed the amount of plutonium the Americans were producing as well as the design of the hydrogen bomb. Jewish spies included Harry Gold, Morris Cohen, David Greenglass (who used to have kosher salami delivered to him at Los Alamos), and of course Julius and Ethel Rosenberg – the Rosenbergs being the only civilians in the history of the United States to be executed for espionage. One can make the case that their judge, Irving Kaufman, himself a Jew, adopted an overly harsh attitude towards them. When their attorney, Emanuel Bloch, petitioned Kaufman to delay their execution from its Friday night schedule in order not to desecrate the Sabbath, he refused, but moved the time up to kill them before the Sabbath came in. It is understandable that Jews in America at that time would want to distance themselves from the acts of those individuals. I asked my father-in-law, who was at Yeshiva University during the Rosenberg trial, what the feelings were on campus at that time. There was a general embarrassment and a desire to dissociate these spies from the Jewish community as a whole. This sentiment is not unknown today, and many American Jews have a similar attitude towards Jonathan Pollard. Certainly, there is no justification for calling into question the allegiance or loyalty of the entire Jewish community based on the conspiratorial acts of a few traitors, but the problem still must be addressed: Why were there so many Jews among the atomic spies? I think that there are three major reasons. First, Jews were disproportionately represented in theoretical physics in general and at Los Alamos specifically. Given that there were so many Jews working on the Manhattan project, one would expect to find them disproportionately engaged in espionage as well. Another key reason most certainly had to do with the war against Hitler. After all, Stalin and his army were the ones fighting and dying on the battlefields of Eastern Europe. Certainly in the early 1940s, the best bet for beating the Nazis was to support the Russians. Rhodes notes that this was a major motivation of the spies – Klaus Fuchs in particular – who saw the evils of the Nazi regime firsthand, (his grandmother, mother, and sister all having committed suicide to avoid capture by the Nazis). Besides, the lend-lease strategy adopted by Roosevelt that shipped supplies to the Soviets may well have included nuclear material, and was based on the same utilitarian reasoning. But I believe there was a third reason that Jews were so taken by Stalin and communism, and that has to do with the fundamental “messianic” desire of Jews – religious and secular alike – for a better, more just world. This dream, which drives so many Jews to the forefronts of human rights groups, of philanthropic activities, of the desire to create a more perfect society – Tikun Olam (perfecting the world) – is a powerful force. It is often so powerful that it can overcome objectivity and blind those who are swept up by the noble aspiration to do good. The dream of a more equitable society that socialism held out (and the early moves by Lenin and Stalin to outlaw anti-Semitism corroborated this hope) was extremely attractive to Jews. Socialism spoke to them so persuasively not only because they suffered from persecution, but because they truly wanted to believe that such a utopian society could be achieved. This passionate yearning blinded many Jews to the signs that Stalin was far from being a savior, and led the atomic spies to justify any means towards achieving exalted ends. Food for thought in these election days (US and Israel) when passions run deep, the stakes seem so high, and the values and principles are so weighty. On each side, the goals are noble and the vision of what is best for the world so clear. Nonetheless, it is important to resist any temptation to quiet one’s moral conscience, and short circuit legitimate discourse and actions – no matter how important the goal. I was not in the U.S. during this period. I was in a border kibbutz in the Western Negev called Kissufim opposite the Gazan town of Deir Al-Balah. When we heard about rabbis going around in Brooklyn and other areas where many Jews living, asking them to sign petitions to save the the Rosenbergs’ lives, we were hopeful that their blood would not be shed. Then the Rosenbergs were killed leaving their children as orphans, we felt that were they not Jewish, they would have still been alive. Under the daily mortar bombings of Abdul Nasser’s army, we felt safer in Israel than in the U.S. The article leaves the strong impression that Klaus Fuchs was a Jew. He was not (in any sense of the term). His father was a Lutheran pastor. Absolutely correct. I had seen indications that he was Jewish, but did not check them thoroughly enough. I will change the text to reflect that. Having said that, he still was ardently anti-Nazi, and that factored heavily in his decision to spy for the Soviets.